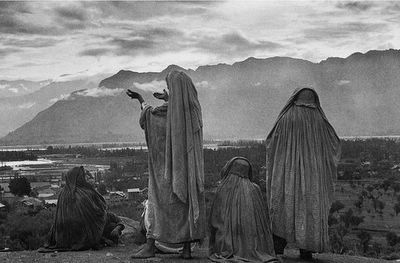 This image of muslim women praying in the capital of Kashmir is a classic example of what I would call a "political landscape." The striking textures and lighting presage what we find today in work by Salgado who regularly is criticized for creating similarly beautiful images. Cartier-Bresson took the photo in 1948, in the immediate wake of Indian independence, the partition, war with Pakistan and the incorporation of Kashmir. Could it be coincidental that the women depicted here are Muslim given that much of contemporary political conflict in the region revolved (and still does) around religion? Does the way Cartier-Bresson uses beauty in the photograph - the composition, lighting, and so forth - detract from the viewers' ability to envision the currents shaping their political world in ways far beyond their own control and, quite possibly, their understanding? Well, now the UN High Commissioner for Human Rights' Committee Against Torture has issued a report demanding (well, perhaps that is too strong a verb and "requesting" is more appropriate) that the US close the Prison at Guantanmo Bay, dismantle the system of secret prisons that it allegedly maintains across East-Central Europe, and North Africa, and generally desist from practices that further violate the internaitonal covenants to which we are signatory. Here is the report form npr and from the Financial Times. BushCo, of course, would love to comply by sending detainees off to countries where they will predictably have little or no protection against mistreatment. And, in the meantime, they also assure us that none of this long-term and secret detention of prisoners in any way is questionable. All of our practices and policies in this area of the "war on terror," they assure the world, are in comformity with US law. Do you believe them? Would you like to buy a bridge? Actually, given that the Committee Against Torture also has taken issue with the inquiries into alleged mistreatment and torture of mostly African-American prisoners by the Chicago Police Department over the course of several decades, perhaps BushCo is not really so far from the mark. Guantanamo is not an isolated problem but, rather, part of a long-term systematic policy that quite assuredly will undermine security in the US and abroad. Just a piece of evidence - in this Salon.com archive of the photos and videos documenting torture and mistreatment at Abu Ghraib, it becomes clear that the policies and practices implemented there migrated with US Military personnel directly from Guantanamo. I won't get to Toronto until the first week in June and so will miss the whole deal; but this month is the 10th Annual Contact - Toronto Photography Festival which seems to have lots of interesting things going on. And it is only half over. "The primary task of a useful teacher is to teach his students to recognize 'inconvenient' facts - I mean facts that are inconvenient to their party opinions. And for every party opinion there are facts that are extremely inconvenient, for my own opinion no less than for others. I believe the teacher accomplishes more than an intellectual task if he compels his audience to accustom itself to the existence of such facts. I would be so immodest as even to apply the expression 'moral achievement' though perhaps this may sound too grandiose for something that should go without saying." - Max Weber, "Science as a Vocation" (1918). The essay by Weber from which I have extracted this passage is, of course, typically seen as a classic brief for separating facts and values in academic settings, especially in the classroom. Let's set aside the large question of whether it is possible coherently to defend anything like a fact-value dichotomy. (On this I recommend Hilary Putnam, The Collapse of the Fact/Value Dichotomy & Other Essays. Harvard UP, 2002.) What Weber is saying here is that, as a practical matter, teachers, especially university teachers, are not in the business of making the classroom a comfortable place. Their task is to challenge the opinions and values students bring with them, to make the students think and question. That may seem "inconvenient" to students seeking simply to confirm their own views, political or otherwise, but even Weber seems to view this difficult and admirable task is central to the teacher's vocation. (Of course, among the "inconvenient facts" that many students find most disturbing is that the world is full of folks who disagree with us about important things like politics, who think our own views are nutty or worse.) And the point of academic freedom, on my view, is that it allows faculty to make the campus and the classroom inconvenient and uncomfortable. What has prompted this post? Last night I was reading a short item in Inside Higher Ed entitled "Fact Checking David Horowitz." Turns out that in his zeal to unmask "dangerous" faculty Mr. Horowitz stumbles repeatedly in terms of his own criteria of truth, fairness and so forth. The passage from Weber ought to illustrate just how far out on the fringe Mr. Horowitz and his acolytes actually have strayed. Normally I would not post even on such matters. However, this morning I arrived at my office to find a business card touting RochesterWatch (www.rochesterwatch.com) tacked to the bulletin board directly outside my office door. (There were none left on the other boards in the department, so I can only surmise that this was intended as a "special" message.) This is a group of right wing zealots who have made some inroads among the students on campus here. So, I suppose I am being "watched." Perhaps whomever left their calling card outside my office should read Weber too. Perhaps, having done so, they would say that they are simply tryig to make campus an "inconvenient" place for me too. That is fine. I am simply talking back without the veil of anonymity. PS: Although I think that playing the "fact-checking" game with Horowitz and his minions is more or less of a time/energy black hole, there are pages that take he and they to task for (let's be polite) "dissembling." For example, see Free Exchange on Campus. (5/13/06). I yesterday I received an e-mail from my friend and colleague Melissa Williams who teaches political theory and is Director of the Centre for Ethics at the University of Toronto. Melissa is publicizing the plight of her former colleague Ramin Jahanbegloo who has been detained without charge by Iranian authorities in Tehran. You can find a reprinted November 2004 interview with him at the web page of Radio Free Europe/ Radio Liberty where he extols the emergence of a new generation of Iranian intellectuals committed to democracy, modernity and gender equality. This is an extremely delicate case insofar as Jahanbegloo is being detained at Evin prison where prisoners have died - presumably as the result of torture. As Melissa makes clear, while queries about Jahanbegloo's condition and letters of support for him are appropriate, these should be respectful and not engage in condemnation of the Iranian regime. Such condemnation may well put Jahanbegloo and other prisoners at greater risk. For guidelines and background on the case follow this link to Amnesty International. UPDATE (5/17/06): Here are stories from Eurozine and Open Democracy that provide background and updates on Jahanbegloo's detention. There has been a lot of talk about "undocumented" immigrants lately. The Bread and Roses Cultural Project (Local 1199 SEIU) has produced a photo book that nicely complements the images of mass protest I posted earlier. 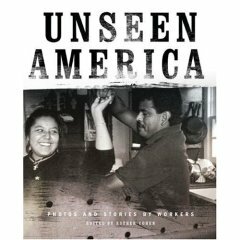 Entitled unseen america the project put cameras in the hands of workers and encouraged them to document their lives - not just their work, their lives. Of the photographers who contributed to the volume 80% are immigrants. The project was coordinated by Esther Cohen and there is an interview with her entitled "Even Doormen Like to Dance" on Alternet (9 May 2006). There Cohen explains why some of the images in the volume are anonymous: "The migrant workers asked to be anonymous. They were the first group we did this project with. They were these guys doing mostly construction work in Long Island, standing by the side of the road. We wanted to work with them because their lives are never explored much, and also they were the subject of a lot of racism in the area they were living in."